E Nothing really new, but a cool combination of props and minifigures from the movie. 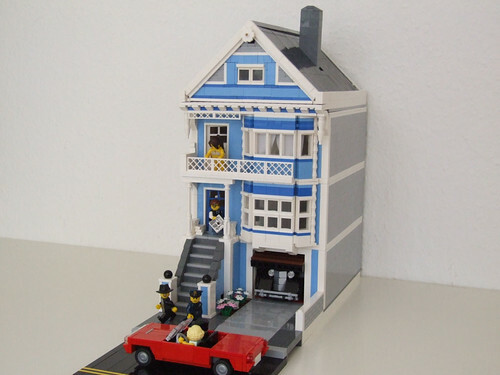 This set contains the parts to build two props from The LEGO Movie that have been released before: Emmet’s Double-Decker Couch and his “smarty” car. 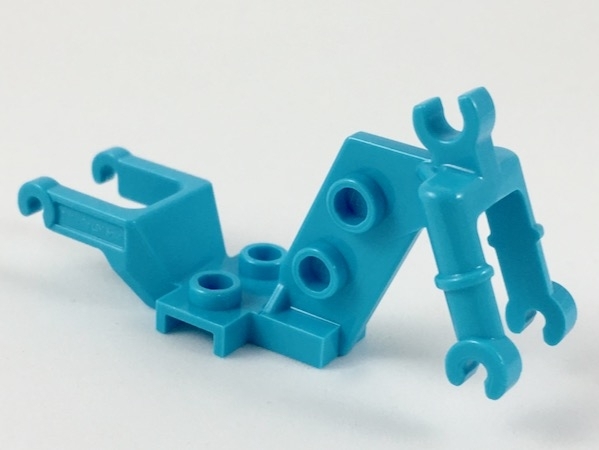 The couch was already part of the 70810 “Sea Cow” and the car was a promotional set for Toys’R’Us. 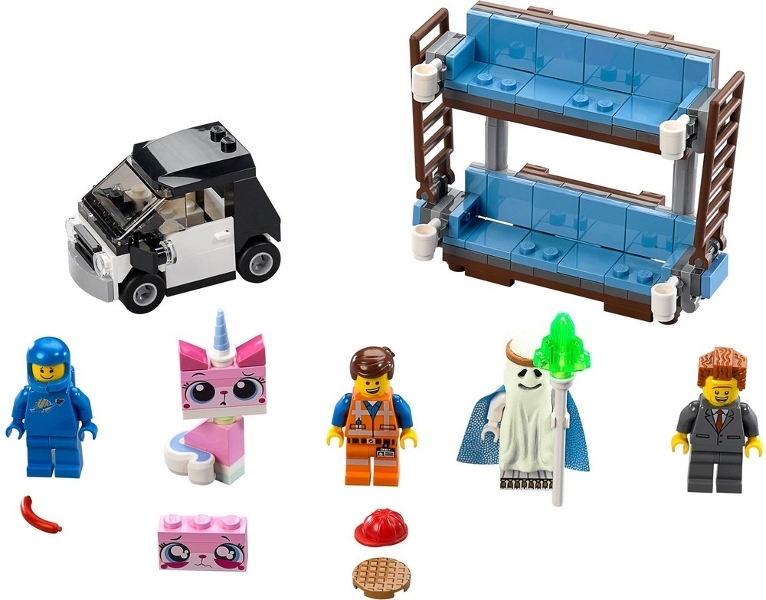 With the selection of minifigures (Benny, Vitruvius’ Ghost, President Business, Emmet + a new Unikitty with two faces) it’s a real fan set. It’s the first smaller set containing Benny or President Business. The set even contains both of them, for me they alone make it worth buying the set. D Nichts wirklich Neues, aber eine coole Kombination von Requisiten und Minifiguren aus dem Film. Das Set enthält die Teile für zwei Requisiten aus dem Film, die schon vorher bekannt waren: Emmets Doppeldecker-Couch und sein “smartes” Auto. Die Couch war schon Teil der 70810 “See-Kuh” und das Auto gab es als Werbeset bei Toys’R’Us. Die Auswahl an Minifiguren (Benny, Vitruvius’ Geist, Präsident Business, Emmet + eine neue Einhorn-Kitty mit zwei Gesichtern) macht es zu einem echten Fan-Set. Es ist das erste kleinere Set, das Benny oder Präsident Business enthält. Hier sind sogar beide drin, für mich rechtfertigt das allein schon den Kauf des Sets. E City may not be my favourite theme, but this new set has a few new parts that are worth thinking about buying the set. First of all there is the new motorcycle frame. The frame is a lot more “flexible” than the older versions. 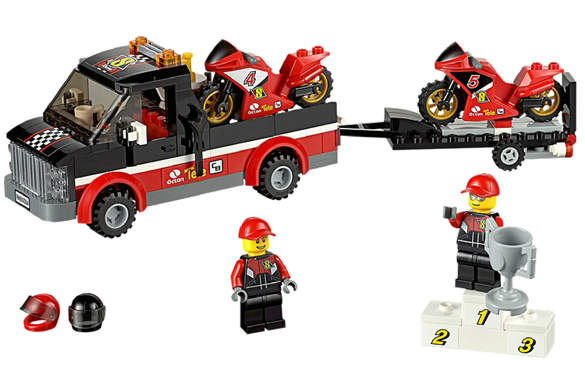 It has two “SNOT” studs on each side and a 1×2 plate as a base for the motorcycle. Instead of the handles it has a “U clip” for the usual handlebar. The fairing is new, too. It has a Superbike design and looks great on the new frame. The only parts of the new motorcycles that don’t look very good are the tyres. It’s definitely time for some street/racing tires for the motorcycle rims, the old off-road tyres just look weird on a racing motorcycle. The third new part is a 2×2 round tile with a single stud in the middle. Combined with one of the 2014 2×2 round tiles with a hole in the middle it makes a perfect 2×2 round upside down converter. D City ist nicht wirklich mein Lieblingsthema, aber dieses Set enthält ein paar interessante Teile, die den Erwerb des Sets wert sein könnten. Zunächst ist da der neue Motorrad-Rahmen. Der Rahmen ist viel “flexibler” nutzbar als die älteren Teile. An beiden Seiten sind je zwei Noppen “SNOT”-Platten angeordnet und die Basis bildet eine 1×2-Platte. Anstatt der Lenkergriffe hat der Rahmen einen U-Clip, an dem z.b. der übliche Motorrad-Lenker befestigt werden kann. Auch die Verkleidung ist neu. Sie sieht aus wie von einem Superbike und ergänzt den Rahmen wunderbar. Die einzigen Teile, die nicht wirklich zum neuen Look passen, sind die Reifen. Es ist wirklich zeit für ein paar Straßen- bzw. Rennreifen, die alten Geländereifen sehen einfach komisch aus auf einer Rennmaschine. Das dritte neue Teil im Set ist eine runde 2×2-Kachel mit einem einzelnen Noppen in der Mitte. Zusammen mit den 2014er 2×2-Kacheln mit Loch in der Mitte ergeben sie einen perfekten runden “Upside Down”-Konverter. Canadair CL-215, a photo by ER0L on Flickr. 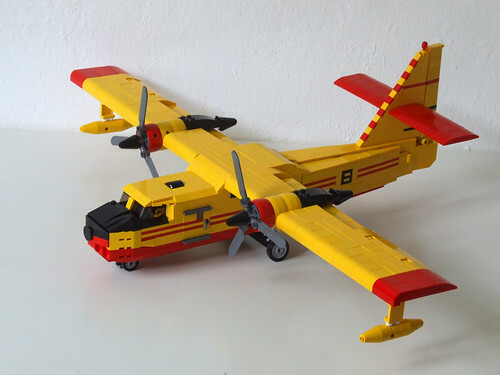 E This minifig scale Canadair CL-215 amphibious waterbomber with PowerFunctions is able to taxi via LCS (see video). The cockpit fits 2 minifig pilots. 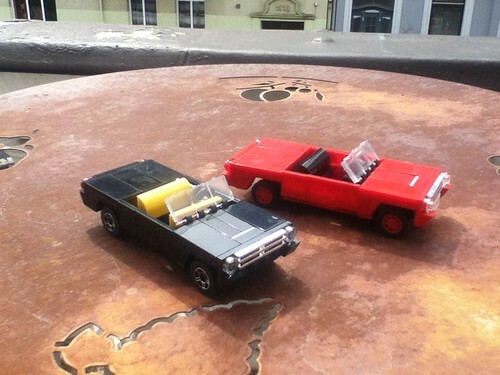 Two Roadsters, a photo by ER0L on Flickr. E A snapshot of Na Dine’s copy of the red Roadster. I really love her black version with those nice rims. D Der kleine Schwarze für die Minifrau von Welt: Schnappschuss eines Roadster-Nachbaus von Na Dine in Schwarz. Sieht sehr gut aus mit diesen Felgen, wie ich finde. E This beautiful Cessna 172 Skyhawk was built by D. P. We really love the sleek design and great details on this aircraft. Plus it fits two figs which is even more amazing (see below). Hopefully we’ll see this in the brick! Take a look at D. P.’s MOCpage to see the different colour schemes of this fine airplane. D Diese wunderschöne Cessna Skyhawk stammt von D. P. So etwas lieben wir natürlich ganz besonders: Schöne glatte Linien, aber trotzdem tolle Details. Und das Beste: 2 Figuren passen auch noch rein (siehe unten). Auf der entsprechenden MOCpage von D. P. gibt es noch mehr Farbvarianten zu sehen. E This modular (built in July 2013) is meant as one of the famous Painted Ladies in San Francisco, the idea being borrowed from Henrik Hoexbroe who has built a whole row of them. In a larger scale you can find them in Legoland California, too. The future town will probably have some Frisco stuff in it, at least there’s already a very fine Cable Car built by Altezza which will be shown here too, of course. There is no interior, but, since cars are still important, a working garage door. The garage even fits the full-size cars. Due to the SNOT road and pavement system there is no usual baseplate, so a width of 21 studs is no problem. Building in an odd width widens the range of possibilities, e.g. you can have cheese on both edges as you can see in the frieze at the gable. The pillars at the bottom of the staircase are shortened versions of the ones used at the Gas Station. The curtains at the windows of the second floor are made out of bridal veils. The garage door (probably) has a new mechanism which allows any width (see below). Little works of art with an overkill of details. E If Steffen Kasteleiner‘s plane ever might crash (let’s hope not), they might want to do so at Tsirane’s City Airport. Because there these awesome Crashtenders are waiting for him. These detailed monsters are so sleek they even might run out a plane. D Wenn Steffen Kasteleiners Flugzeuge jemals abstürzen (hoffentlich nicht), sollten sie dies auf Tsiranes City Airport tun. Weil er mit diesen wunderbaren und detaillierten Flugfeldlöschfahrzeugen ausgerüstet ist. NL Mochten Steffen Kasteleiner‘s vliegtuigen ooit een noodlanding moeten maken (liever niet), dan kunnen ze dat maar beter op Tsirane’s City Airport doen. Want daar wachten deze monsterlijk gedetaileerde Crashtenders op ze.